With smartphone and tablet gaming becoming so dominant in the world of casual gaming is there still room for a dedicated handheld gaming console? Sony certainly thinks so with a refresh of the PlayStation Vita, now in its slimmer form factor, better known as the PS Vita Slim. Or, to be technical, the Vita PCH-2000 - but nobody is going to adopt that name. It's not entirely new, though, as the handheld has been available in Japan for many months and arrived on UK shores in February 2014 following a successful PlayStation 4 launch. 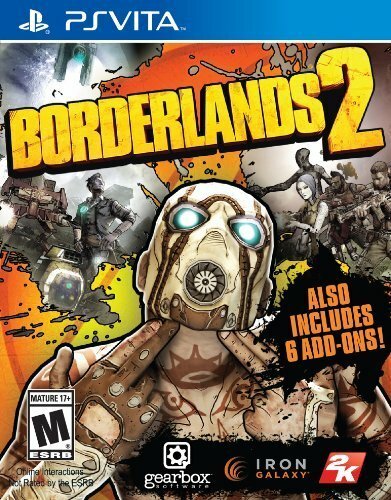 Now it's the turn of the US where it's released with Borderlands 2 bundled in for the $200 price. It the PS Vita Slim worth as an enhancement of that PS4 under the telly, or, if you've already invested in a Vita, is it truly worth upgrading to? We've been playing with the Vita Slim to see whether it's worth the bother or is instead a step backwards from the original. If you're new to Vita then a quick rundown to explain what it's all about. In 2012 when original Vita console launched it was all about its own-format games. There were a few apps, downloads, Sony services and, in some instances - such as with WipEout 2048 - you could use Cross-Play to play against a PlayStation 3 owner also playing the same title. Since then the launch of PlayStation 4 has brought with it Remote Play, a Wi-Fi feature that acts like a mirror image of what's happening on the PS4 but on the Vita's screen. It works with all PS4 games, so if Downton Abbey is on telly and you're more keen to blast aliens in the face than watch old ladies in bonnets then you can while leaving the telly free for the rest of the family. You needn't be sat in front of the PS4 either as you can play anywhere there's a Wi-Fi signal. Throughout 2013 the Vita's own line of games grew stronger too, making it a standalone handheld console worth considering. Titles such as Tearaway, devised by the Little Big Planet creators Media Molecule, gave it extra gravitas in its own right. But in 2014 it's PS4 owners that will take significant benefit - it's no coincidence that the Slim arrives just after the Christmas rush for Sony's under-the-telly PS4. It's clear from even just looking at the Vita Slim that things have changed when it comes to the look and feel of the device. As the name suggests it's thinner than the original Vita, but also lighter too. The button placement has been slightly rejigged and there's a new lick of paint along with the slimmed down design. The 5-inch touchscreen interface remains the same size as its predecessor and still dominates the Vita's design, but it has shifted from the OLED format of the original model to an LCD one in the Slim. That does have some impact on the performance and capabilities of what you'll see during those gaming experiences. More on that later. Aside from the screen, the buttons have been tweaked ever so slightly, but for the better. Around the d-pad and action buttons Sony has removed the matte finish, instead opting for a smooth surface, while the Select, Start and PlayStation buttons are now also circular rather than oblong. It's a small change, but one that means you can now actually press them more easily. On the reverse side, the touchpad control - used for some games - is now smaller, while the two hand rests are much bigger, almost double the size. Plenty of space to work your finger magic here. In making it thinner, the PS Vita Slim has lost a few ports. The storage slot and gaming cartridge slot are still present, but the dedicated charging socket has been changed to micro USB, and the expansion port on the top, previously buried under a flap, has been ditched entirely. In the UK, Sony also won't be offering a 3G version of the Slim - it's Wi-Fi all the way. It turns out silver edging on our consumer electronics kit is so not 2014, so Sony has ditched that too. The Vita Slim is all black, and that's it. Simple but effective. You can get coloured versions of the Vita Slim in Japan, but for the moment in the UK it's mono and mono only. All these tweaks and changes mean that Sony claim the PS Vita Slim is 15 per cent lighter than the original, but in use it feels like a lot more than that. It weighs 219g compared to the original's 260g weight, but we've noticed that makes a huge difference, especially when you are playing for any length of time. It might only be 45g but it makes a surprising difference. Think about it this way: it's roughly the same as five £1 coins, and so, for us, it made the Slim feel more like 50 per cent lighter somehow. On the dimensions front, for those counting, the PS Vita Slim has roughly the same proportions as the original PS Vita when seen face-on - that's 85.1 x 183.6mm to 83.5 x 182mm numbers fans - but is obviously thinner. But not by as much as the name might suggest: the PS Vita Slim is 15mm thick, while the PS Vita is 18mm, so there's only 3mm in it. Having played on the original Vita since its launch in 2012 we've just got used to enjoying the impressive OLED screen offering that Sony debuted with. And now we're in possession of the Slim's new LCD screen we can confirm that OLED is clearly the better of the two. The colours are vibrant, well defined, and the screen delivers a great viewing angle. The LCD offering on the new Vita Slim isn't as good, but that's not to say that it is a bad experience. Sony has told us that the company hasn't turned to Sony mobile for help with the screen tech so there is no Bravia engine powering it, or Triluminos tech to be found here. Although the Slim's image looks a little washed out towards the edge when tilting it, the LCD panel is still good enough. Cost cutting, and the urge to make the device more profitable, are probably the biggest reasons for the change. When the original Wi-Fi Vita launched in 2012 it was £230. The Vita Slim is £50 less two years on at £180. Sounds good, but the reality is the better screen, slightly fatter original model can be picked up on Amazon for under £150 at the time of writing. Prices will bob around and settle down over time, but if you want the latest and slimmest then, well, you're going to have to pay out for it. That is time limited, however, as Sony has confirmed that the OLED Vita has been discontinued so once stock has run out it's gone, so it's not like you'll have a choice anyway. So Sony has downgraded the screen, shrunk the design, and changed the charging point. Is anything upgraded? Yes, there are some new positive reasons to edge towards the Slim. You now get 1GB of internal storage, up from nothing in the original, so you can at least save stuff from the start without immediately having to go out and buy an additional memory card. Second, and importantly, is that Sony has improved the battery life. You now get 4-6 hours of gaming from a single charge - something that we've been experiencing in our play time. It's slightly less if you go for something a bit more demanding, but the device also has a good idle state when it comes to preserving battery too so the Slim won't drain and die in your bag when you aren't playing. It may be slim by name but, in some respects, it's fatter on the features front and more worthy of consideration than the original. And riding on the back of the PlayStation 4's success, we suspect the latest Remote Play features and a bustling array of newer titles and features will be a core reason to look at the Vita with fresh eyes - not just because it's lost a bit of weight. The PS Vita Slim is best described as the replacement for the now two-year-old Vita. Because that's what it is, not so much a model for upgraders. There are some changes, not necessarily all for the positive, but the Slim isn't an overhaul of the Vita concept. It's all about reinvigorating interest in a product that now, in 2014, is considerably stronger than the 2012 original was. And not because of the size or because of the screen, but because of the features, PS4 compatibility and, of course, the games. If you've yet to play with the Vita, the good news is that the experience is a good one. You won't mind about the LCD screen not being quite as good as the earlier OLED one because, simply, you won't know. With some proper good games to thumbstick your way through there's life in the Vita as a portable, but - and most of all - is that if you have a PS4 then you'll enjoy the ability to play your under-the-telly games console anywhere you can get a decent Wi-Fi connection. Remote Play is the real winner. If you love playing PS4 then adding a Vita into the mix is a no brainer. But if you've not converted to the next generation of gaming and really only play causal games on your tablet then there is nothing much here apart from the odd game or two that will convince you step in and start enjoying. The PS Vita Slim is a great device that's now stronger than ever, but one that's still limited in its appeal.